In every business, operations are usually smooth until one co-owner passes on or want to exit. When this happens, how can one maintain balance and continuity while exiting at a fair value? I need to find an exit for my shares when I am not around. A well-constructed plan is essential to protect the value of the business and provide cash for the family in the event there is a major disruption in the business due to a co-owner’s death, disability, retirement or serious major illness or any other event that jeopardizes the continuity of the business. If a co-owner dies today, can you work with his family to run the business? Will the co-owner’s family members know how to run the business with you? Can they work well with you? Would your beneficiaries be able to get a fair price? Do you have the funds to buy out the co-owner’s shares/interests from the family members when there is no pre-agreed price in a written agreement? Can the shares/interests you are purchasing be transferred quickly to you? A new partnership is created due to the inheritance of the shares/interest by inexperienced heirs. Chances are this new partnership may fail. There is no pre-agreed price for any sale to take place when the heirs decide to sell to the other co-owners. As a result, it may take years to settle a transaction price. Some of the unqualified heirs may insist on being directors of the company and be active in running the business. This may lead to serious disruptions and disputes within management. It is possible that the co-owners may decide to abandon the business and start their own due to disputes with the heirs. Loss of profits and uncertainty about the business future success. After all your hard work in building your business, you need to avoid such problems. 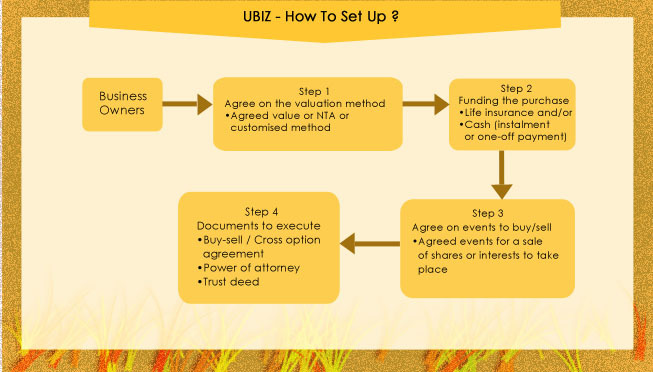 Buy-Sell or Cross Option Agreement: covering the terms of the sale and purchase including the agreed value or formula, events triggering a sale, funding and mode of payment. Power of Attorney: authorizing us, Rockwills Trustee, to transfer the shares/interests to the other co-owner(s) upon the occurrence of the agreed events that trigger a sale. Trust Deed by the co-owners: instructions to Rockwills Trustee regarding the periodical distribution of the sale proceeds to prevent these being misspent by the beneficiaries. Life insurance policy: as the main funding mechanism to purchase the shares/interest of the outgoing co-owner. When an event occurs triggering a sale? Guarantees the sale of shares/interest at a full and fair value that was agreed by co-owners. Prevents inexperienced and unqualified heirs from being involved in the business or the selling of the deceased’s shares to outsiders. Smooth transfer of ownership to the co-owners is ensured by the Trustee. Using life insurance, the purchase of the shares/interest becomes very affordable, minimizing the need to use your savings for the purchase. 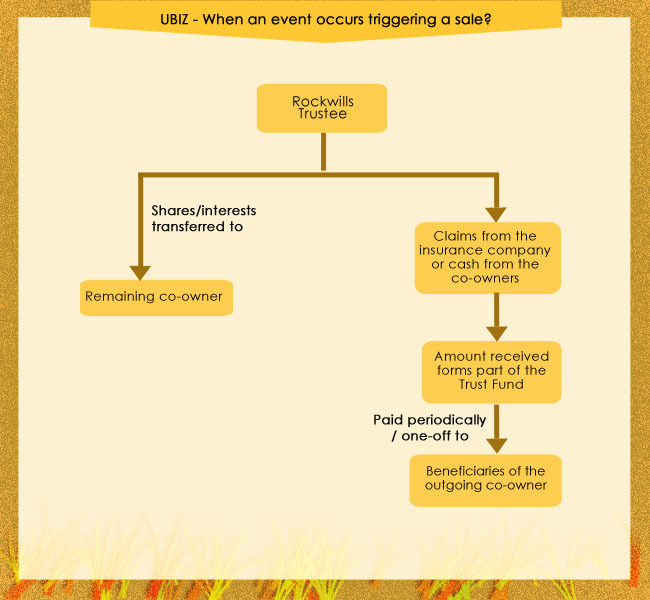 Rockwills Trustee acts as the Trustee for UBiz protecting the interests of your beneficiaries and that of the co-owners.